Okay everyone, it's time to find out what Old Man Winter has in store for us Canucks in 2017. As some of you experienced a mild winter (Ontario) while others were bathed in early winter storms in 2016, forecasts call for a return to "classic Canadian winter weather" in the months of January and February, leading all the way into Spring. In the West Coast, in B.C., expect a drier second half, as compared to last year (2016) with early snowstorms having hit the area. Drier, interspersed with bouts of Arctic cold. In Alberta, and the Prairies, expect extreme Arctic front, bringing in much colder weather, but also drier, with brief spurts of snowfall. In the East, expect snow storms (significant at times) and a much colder front. In the Atlantic region, much snow with significant storms are expected, including a much colder front. The provinces closer to the Atlantic coast -- PEI. Nova Scotia -- will experience a wintry mix of rain, snow, and ice. Much more snow will be expected for these regions (in February) every now and then, though a brutal winter is not being forecast in spite of the inclement winter weather. Also, in the North, expect a milder (warmer) winter, a trend that has continued for quite some time. Overall, Canada will experience a much colder second half, with extreme Arctic cold temperatures at times. Much of this concentration will be in the Prairies region. The accumulation of snow will be felt more in the East and Atlantic regions, while temperatures there will not be as severe or long-lasting as in the Prairies. So, folks, get real winter ready. Looks like you're gonna need your snow shovels! Hurricane Harvey called an "unprecedented" storm. Global warming, climate change are factors. Human/economic activity have increased the incidence of such a storm that gained impact rather than subsiding. Harvey is a dire warning of what may be more storms to come in the near future if climate change and all other factors that go into that vicious mix is not tackled with prudent solutions. May God bless the people of Houston. According to experts in the field, climate change does generally cause average storms to intensify-- hurricanes will strengthen more rapidly in warming climates. This is essentially what climate change experts consider the most striking aspect of hurricane Harvey: how quickly the storm intensified. On Friday, Harvey was considered a tropical storm, with winds at 45 mph. By Friday, it had intensified to a category 2 storm, with roaring winds of 110 mph. A study published by the American Meterological Society earlier this year found that “24 hour pre-landfall intensifications of 100 [knots], which are essentially nonexistent in the late twentieth-century climate may occur as frequently as once per century by the end of this century,” and concluded that global warming “substantially” increases the rapid intensification of storms before they hit the ground. But in order to argue that climate change may play a role in fueling hurricanes, one has to understand the factors that contribute to their power. Hurricanes typically form over large bodies of warm water, deriving energy from the evaporation of water from the ocean surface. As the world warms, evaporation speeds up, generating more water vapor for storms to sweep up and dump on storm areas. Statistics show that the sea level along the Texas coast was the highest it’s been in 100 years due to melting glaciers and the swelling of the ocean surface. At the time that Harvey began to gain momentum, the Gulf was one of the hottest spots of ocean surface in the world – acting as “fuel” for a tropical storm, enabling the hurricane to churn up water from almost 200 meters below the ocean surface. Storms weaken once cold water is churned up from below, so the warmer the water—the fiercer the storm will surge. A 2016 study conducted by the European Geosciences Union revealed that anthropogenic climate change—climate change as a result of human activity – increased the probability of extreme rainfall on the Gulf Coast by 1.4 times. ...Houston is the self-proclaimed capital of fuel production in the US—specializing in gas and oil—there may be a feasible link between the extreme weather and the constant emission of greenhouse gases. Greenhouse gas emissions, ultimately linked to an increase in temperature, also enables the atmosphere to hold more moisture—roughly 7 per cent more with each degree added to the baseline temperature. How climate change is affecting the survival of Canada's Arctic creatures, as this documentary illustrates sadly. A polar bear, who uses wind direction to lead it to it's prey (seals), but in this case, the wind is moving faster affectng it's sense of smell to lead it to it's food source. When this happens, as well as the warming of the sea ice where most of the seals are, it leads to starvation. A starving polar bear is a stark reminder of how clinate change ails Canada's Arctic and a vivid call to action. Record low temperatures in Toronto yesterday ( Friday ) at - 23°C. Coupled with the wind chill, it felt more like -42°C. It shattered the mark set in 1959 for a January day which was orihinally at -20°C. Today, a low of -17° C is expected eith wind chill factoring in the temperature at -3°C. These are the January cold snaps this city ( & country ) often experience, but, this time the rest of North America - -from Florida to the US Midwest, to the Northeast to Atlantic Canada - - has experienced a variation on a theme of frigid freezing temperatures & storms including the "weather bomb cyclone " which includes hurricane-force winds to add to the storm surge. The wintry storms actually began in December, then resurging in this New Year. Frozen Iguanas. "Cold-shocked" dead sharks. Too cold for Penguins to be outdoors in the Calgary Zoo. Huh? Whaa? Yep. And that is no joke. What does Winter 2018 look like, now that the weather has proven itself to have started the New Year off mightily? What is Canada in for? 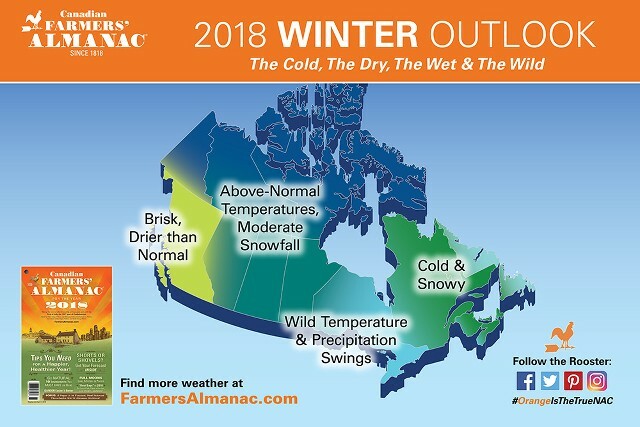 The map below tells the tale, from the 2018 Old Farmer's Almanac, a pretty accurate predictor of weather patterns, for both Canada & the Unired States. In essence, traditional, classic Canadian winter makes comeback. It already has in fact, with a bang not a whimper. Stay safe. Stay warm (dress in layers). Be prepared for emergencies. Snow in Huh-waii?? You better believe it as Maui was blanketed by the white stuff, as the island was taken aback by a 'winter' storm, which consisted of gale force winds and flooding. And snow in selected places.